Thursday 11 May. 6:30 to 8:30 pm (approx). 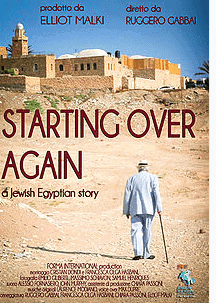 UK Premiere of film about the exodus of Jews of Egypt by Elliot Malki. Association of Jews from Egypt/Harif. Oriental refreshments and soft drinks followed by hour-long film. ORT House, Camden. Harif/ Association of Jews from Egypt. £10. Booking info@harif.org or ring Maurice Maleh on 01923 86 9180 /07815 455989.